This is an NCLEX review question on compartment syndrome. This question provides a scenario about a patient with a bone fracture who has a cast and explains that the patient is having pain with passive movement that is not relieved with pain medication. How will you respond to this patient? A. Reassure the patient that this is normal after a bone fracture, and reposition the cast. B. Re-adjust the cast to ensure it fits snugly against the fracture. D. Elevate the leg above heart level. E. Loosen and remove restrictive items. To answer this question, you must think back to the complications of a bone fracture. What complications happen with a bone fracture? Osteomyelitis (infection), COMPARTMENT SYNDROME, fat embolism etc. How do we know this patient is experiencing compartment syndrome? The patient’s signs and symptoms…remember the 6 P’s: (pain medication is NOT relieving the pain and they’re having pain with passive movement like stretching-> VERY CONCERNING, and this is usually the earliest sign you will see in compartment syndrome!! Plus, the fact they have a bone fracture with cast placement because remember cast placement can cause compartment syndrome too. Compartment syndrome occurs when too much pressure is exerted within the muscle compartments found within the fascia. This can occur when there is hemorrhaging (bleeding) or swelling present after an injury, like with a bone fracture (or with external factors like a cast being too tight or traction). All this can increase the pressure within the compartments. As the pressure builds within the compartment, this will cut off the blood supply and nerve function to this muscle. If not corrected within 6 hours, the damage is permanent. Remember from anatomy and physiology that in the leg and arm there are individual compartments grouped together (but separated from one another) that contain bone, muscle, nerves, and vessels. Each compartment usually has its own muscle, nerve, and vessel supply. 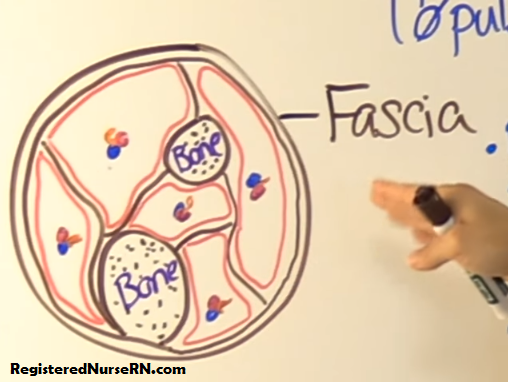 Fascia is what keeps all these structures in place and separated. The important thing to remember about fascia when talking about compartment syndrome is that is does NOT expand when pressure increases within a compartment (so there will be no relief within the compartment from the fascia). Instead the pressure stays within the compartment and causes blood vessel and nerve function to become compromised (diminished). So, ischemia is going to occur to the muscle and distal extremity to the fracture. Therefore, what are you going to do for a patient experiencing compartment syndrome? prepare the patient for possible bivalvement of the cast or reduction of weight in the traction per MD order, and in severe cases a fasciotomy. Pain: worst with passive touch or movement, elevating the limb, or any pressure, stretching increases the pain. Pain medication is not relieving it. Paresthesia: patient may report it feels like the extremity distal to the fracture feels like it is falling asleep or a “pin and needle” sensation. Can they feel you touch their extremity? ALWAYS CHECK THE UNAFFECTED EXTREMITY TO COMPARE! Pallor: Extremity should be pink and have normal capillary refill less than 2 seconds. In CS, it may appear pale or dusky and have a capillary refill greater than 2 seconds. ALWAYS CHECK THE UNAFFECTED EXTREMITY TO COMPARE! Paralysis: can the patient move the distal extremity from the fracture or has the movement decreased…this is a bad sign! ALWAYS CHECK THE UNAFFECTED EXTREMITY TO COMPARE! Poikilothermia: This occurs when the affected extremity distal from the fracture feels cooler to the touch compared to the unaffected extremity. The extremity can NOT regulate its temperature. A. Reassure the patient that this is normal after a bone fracture, and reposition the cast. ELIMINATED! This is not normal and should be investigated/reported to the physician along with performing some nursing interventions. B. Re-adjust the cast to ensure it fits snugly against the fracture. ELIMINATED! We definitely don’t want to do this because this will increase the muscle’s compartment pressure even more. We want to decrease pressure and re-adjusting the cast to fit more snugly will cause more problems. C. Perform neurovascular checks. CORRECT! As discussed above in detail, we want to check the 6 P’s….pain (early sign), paresthesia, pallor, paralyisis, poikilothermia, pulselessness (late sign). D. Elevate the leg above heart level. ELIMINATED! We want to keep the leg AT HEART LEVEL, not above it. Keep the extremity at heart level helps maintain arterial pressure, which is very important because the muscle compartment is experiencing ischemia. E. Loosen and remove restrictive items. CORRECT! Yes, we most definitely want to do this to help alleviate any extra pressure on the compartment! F. Notify the physician. CORRECT! Of course, we will be doing this while simultaneously doing all the other things. The MD may order bivalvement of the cast (cutting it in half) or performing a fasciotomy in severe cases.